Come and see the new Ranger 150 side x side Youth bike. It has the all new Geofencing technology so you can control where and how fast your children ride, all from your phone. Other safety features include a protective cage, seatbelts, nets, safety flag and 2 helmets. 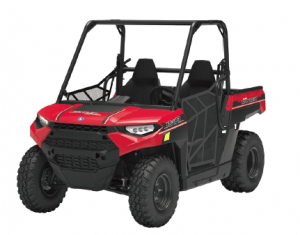 Features an adjustable steering wheel and drivers seat, and digital speed limiting capabilities, the Ranger 150 is perfect for growing kids.